The Asian Development Bank (ADB) stated in its Asian Development Outlook (ADO) report, which was released on Wednesday (11/04), that it expects the Indonesian economy to expand by 5.3 percent year-on-year (y/y) in 2018 and 2019 on the back of rising investment and an improvement in household consumption. Winfried Wicklein, ADB's Country Director for Indonesia, said the government's management of the Indonesian economy remains strong, while the structural reform push will result in more direct investment. This will lead to higher and more inclusive growth for Indonesia, Southeast Asia's largest economy, in the future. He emphasized that strengthening investment has already improved the quality of Indonesia's economic growth, led by higher capital spending from the central government for the infrastructure development program. The government's investment in infrastructure is actually expected to peak in 2018, especially for projects in energy and transportation as well as those related to the 2018 Asian Games in Jakarta (Java) and Palembang (Sumatra) in August. Meanwhile, several large projects that are being developed by state-owned enterprises (SOEs)are scheduled for completion in 2018 or 2019. The pace of investment realization in Indonesia is expected to continue to rise, driven by positive business sentiments that stem from structural reforms, along with the acceleration of a number of national strategic projects. Meanwhile, the nation's current account deficit is expected to increase slightly in 2018 and 2019 as export growth is projected to slow, while imports should remain strong amid high demand for capital goods. Inflation is also expected to rise slightly. However, it should remain within the central bank's target range. 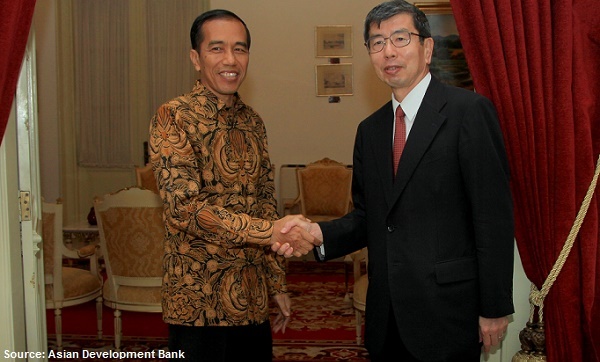 The ADB also warned that, externally, risks to the Indonesian economy stem from monetary policy adjustments in developed countries as well as rising global trade tensions (a looming global trade war that would impact negatively on commodity prices) and geopolitical tensions. Domestically, a traditional problem is that the Indonesian government fails to tap the tax income potential and this may lead to a delay in public spending. Meanwhile, recently falling consumer confidence and CEO confidence as well as sluggish household consumption that is expected to have remained below the 5 percent (y/y) level in Q1-2018 could put the brakes on Indonesia's accelerating economic growth. The Indonesian government itself set a 5.4 percent (y/y) GDP growth target in the Revised 2018 State Budget. In the preceding year, 2017, the nation's growth only reached 5.07 percent (y/y), missing the government's revised target of 5.2 percent (y/y).